I got a lovely big bag of lemons from a friend which needed using immediately so thought I would make a big batch of lemon curd to add to my Christmas goodie baskets. The recipe I now use is a microwave one, which means it doesn't keep as long, but who keeps lemon curd for any length of time anyway, I know as soon as its opened the jar is emptied in lightning speed time! This recipe saves the whole stirring over a pot of boiling water thing (another thing I hate, but have to do it for hollandaise, still trying to work out a way of circumventing that!!) Its the addition of cornflour that makes it easy, not very purist I know, but failsafe and yummy....I am all for that! The recipe is by Simon Holst and is actually for passionfruit curd, which I always make when passionfruit are plentiful, and just up the quantity of lemon juice for the plain lemon version. 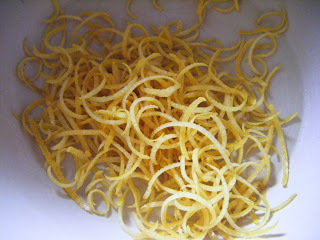 I also put lemon zest in, I love lots but you can do it to your own tastes, but don't leave it out as it truly makes it! 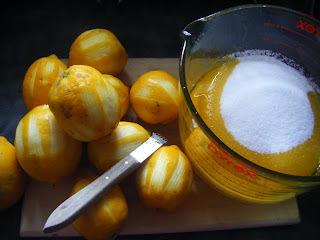 I quadrupled this recipe and put in 1½ cups of lemon juice and the zest from about eight lemons! This quantity netted me 7 cups of curd! Melt butter in microwave. Stir in sugar and cornflour. Add eggs and beat until well mixed but not frothy. 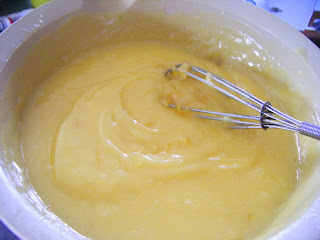 Stir in passionfruit, lemon juice and zest. Mix well and microwave on high in 1 minute bursts. All up it should take about 4-6 minutes to be lovely and thick and ready to bottle. Pop into sterilised jars and store in the fridge. 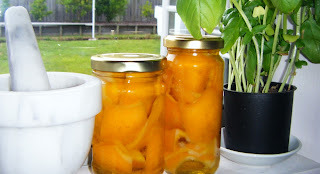 While I was dealing with lemons I decided to finish off the preserved lemons I had made and were lurking in a dark cupboard. I fetched them out of their big jar and got rid of the flesh (which gets discarded when you use them anyway!) 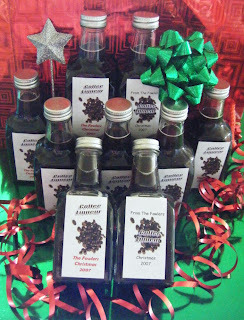 and bottled them with some olive oil, also to give away (have kept one for myself though!). This stuff is gorgeous chopped up and stirred through couscous, or mixed into yoghurt with mint as an accompaniment for fish and chicken. I love it! I got the recipe from Stephanie Alexanders lovely weighty book The Cook's Companionand was so surprised at how easy they were to do. I will definitely be doing them again once I have worked through my current supply. Another thing I have had brewing for the last few months is some coffee liqueur. I got this recipe again from Violets pantry, this time from the lovely Het. As soon as I gathered the ingredients together for it I knew it was going to be a winner and what do you know, it IS! I have added some more sugar syrup to it to calm it down a little as it is KICKING! I found some cute little bottles for it and in total (with the addition of about 1½ cups of sugar syrup) it made 2 litres. Which makes it reasonably cost effective if you can get ok priced vanilla pods and Vodka on special (my mother always gets me some duty free!!). Use a decent vodka though, as it would affect the quality I think. Put all the ingredients in a bottle or sealable jar of a litre and a half. Forget about it for six weeks of more (if you don't forget about it, pamper it by shaking the bottle or jar every now and then). Sift it and put it in a serving bottle, or just use it from it's jar while being carefull not to eat the beans (I think they are yuk!). Excellent xmas gift in a nice little bottle, and lovely for after dinner! Look at what also arrived on my doorstep yesterday. 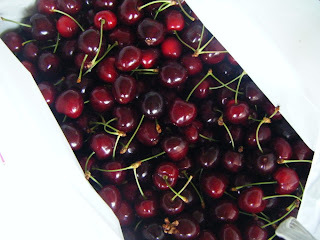 Georgous South Island cherries, we have been getting these couriered to us for the last 3 years for Christmas. They are exceptional value for money at about $14 per kilo, especially as they are export quality and keep beautifully. This year I am going to order some more after Christmas to do some baking and preserving with them, as we gobble all these ones up so quickly! I am trying my hand at hot smoking some salmon tonight so am really looking forward to that as it is the first time I have done it. Will report back on how it goes! What beautiful and thoughtful homemade gifts! Your goodies would be a real treat to receive. Can you make the curd with another type of fruit pulp? I can't find passion fruit where I live. 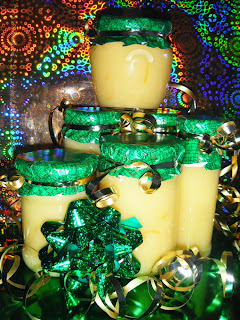 I would love to get this as a gift...looks delicious! Gotta try this! I also hate having to constantly stir curd over a double boiler. It can easily be screwed up.